I recently got a chance to spend some time in Hawaii, more specifically on the island of Oahu. Beer drinkers there will quickly realize there are essentially three breweries among the islands: Kona, Maui, and Primo (the biggest by far). So I took the opportunity to sample as many offering from Maui as possible, which was nicely facilitated by the Whole Foods in Kailua. Meet "Mana": a traditional, unfiltered wheat ale that is light bodied and refreshing. But, Maui takes it an extra step by including real Hawaiian pineapples in the brewing process, and that makes this really flippin' delicious. 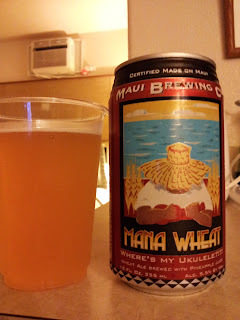 This kind of additive could create a foul tasting ale, or simply an unbalanced one if used improperly, but Maui has impressively pulled it off. The results speak for themselves: and average wheat ale is transformed into and excellent and memorable one. I would also argue that the pineapple addition is even better than using oranges from Redlands.